The survival of the magnificent east window with its wonderful glass dating from around c.1300 is an extraordinary story. Whilst carrying out repairs to one of the walls in the nineteenth century a large number of panels of glass were discovered. They were almost certainly put there in the early seventeenth century when the puritan iconoclasm was at its height. They then seem to have been forgotten or the person who hid the glass did not live to reveal their secret. 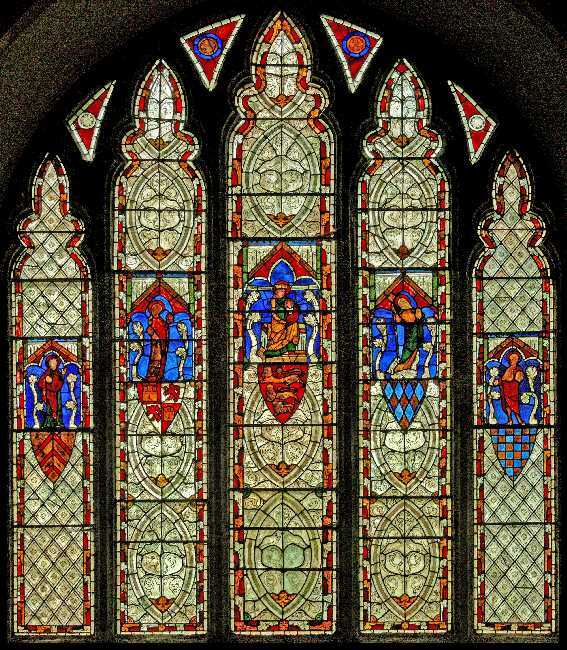 The window turned out to be this completely intact collection of glass depicting five saints and five coats of arms belonging to the local gentry and showing off their connections with royalty. They are all set against superb examples of grisaille with its painted decoration.